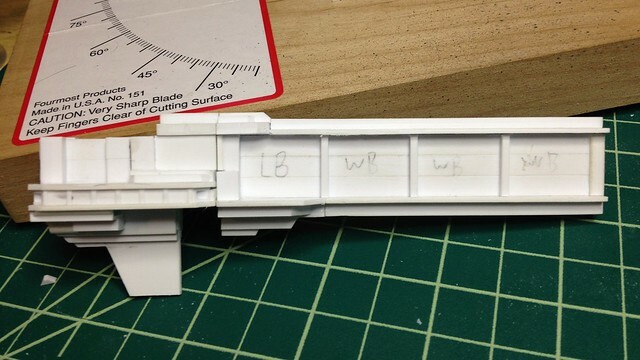 Call me crazy but I decided today to start scratch building a dreadnought for BFG. I drew up a sketch and started getting to work. 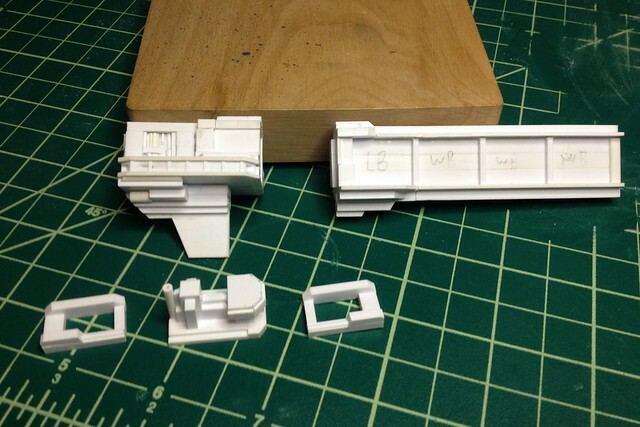 To begin I laid down the basic frame for the keel and started on some of the weapon modules. The launch bays are just 2 of the gw bits that I shaved most of one side off of and then glued together to have the proper height and the feel of being one large launch bay. The weapons battery I scratch built. 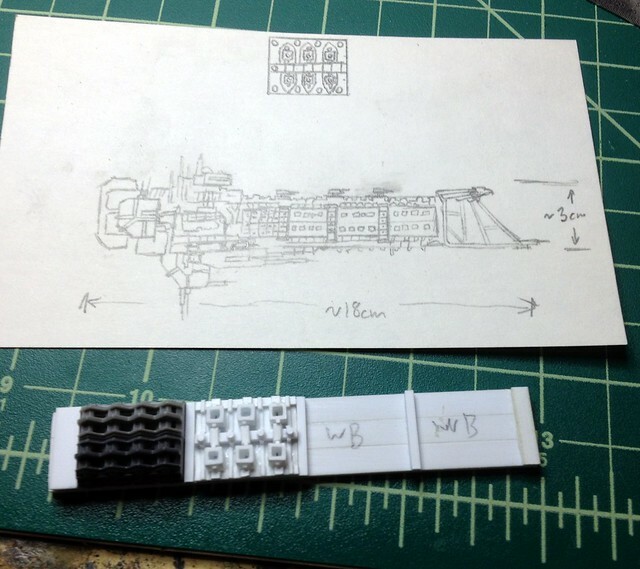 Here it is next to the scale(ish) sketch I drew up first. It's not quite done yet, I still need to fill the squares and then drill out some round barrels. Triton is one of Neptune's moons and since I already have the Neptune Frigate, then why not a dreadnought shipyard in orbit around Triton. Keep checking back for more. I hope to keep working full steam ahead. Very ambitious and a good start! You should be a little more precise with your assembly though - a few of the details on the weapons battery are a little sloppy.Design wise so far so good though! The more I see it the more mistakes I see in it. I really tried to take my time in building the gun battery, but I think I did get a little over eager to see it complete. Will be slowing down the work on the hull to try to fix that. I am happy with the overall look though. It seemed as I placed a part it would look right, then later it would seem out of place, especially the gun tubes. 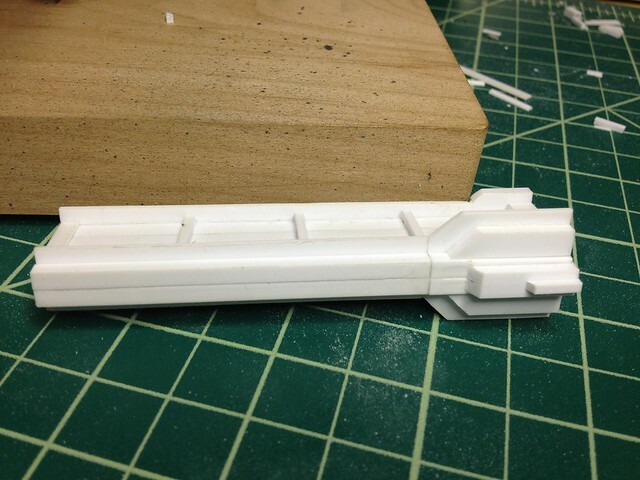 My cutter does not cut short sections quite straight enough due to the difference in resistance favoring the short end of the piece, especially noticeable in the thicker styrene. Not sure how I am going to remedy this as of yet. Keep ya posted. Honestly most of the time you need to dress an edge after cutting it (at least for all but the really fine styrene strips). I keep a square of 320 grit sandpaper (about 100x100mm) on my desk specifically for this. So for example to cut a piece of tube I will sand the end of the tube perpendicular. Then cut off a slightly longer length than required. Glue the previously sanded edge to the part and then use either a sanding stick or the square of sandpaper to clean up the cut end of the tube. Thanks for the pointers, mangozac. I've got some sandpaper on my desk I use for cleaning up like you say, I just think I tried to rush it a bit. I may have to make myself a sanding block to help get them square as well. That being said, I have made a bit of progress today. Took a bit more time to try to keep everything square, and trim. 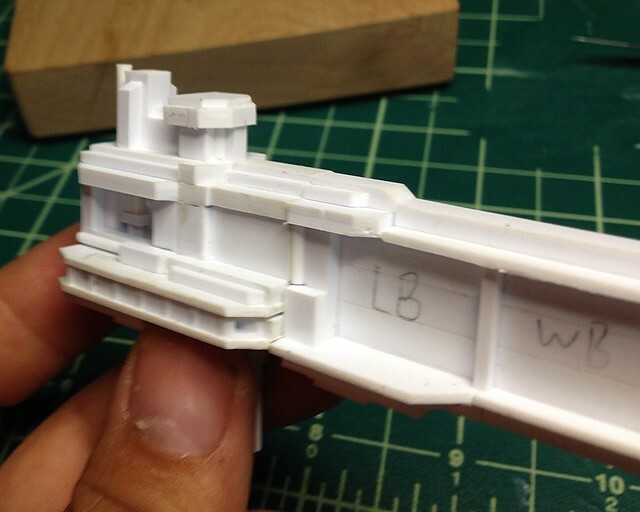 Worked out pretty well and I got the form pretty much done for the central part of the hull. Obviously there will be a ton of stuff to be added to this in a similar fashion to all of the Imperial ships. 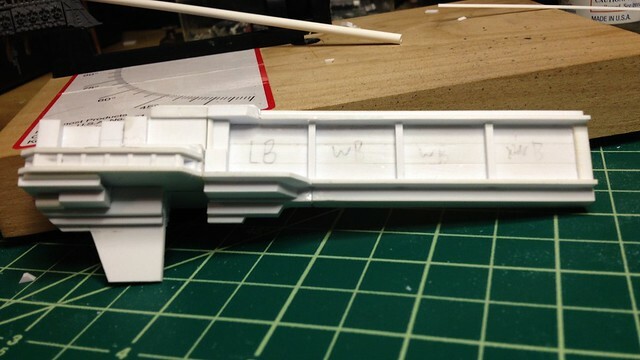 Next step will be to start bulking out the rear of the hull and the bridge. That is coming together nicely, looks very clean so far! Thanks for the kind words, mangozac. Another day and some more progress. 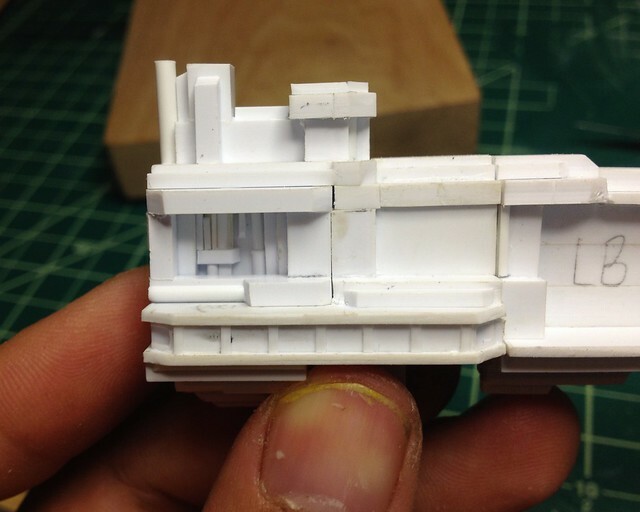 Started on the rear superstructure the other evening and felt I had enough done tonight to get an update out. I still have a lot of work to do on the upper half of it, including constructing a bridge and the 2 side slots, similar to how the Imperial Navy ships go together. 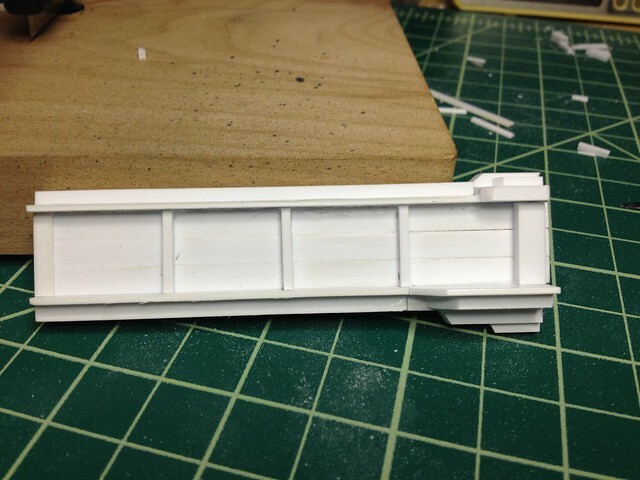 The sides will have small barrels for more guns between each of the vertical strips. 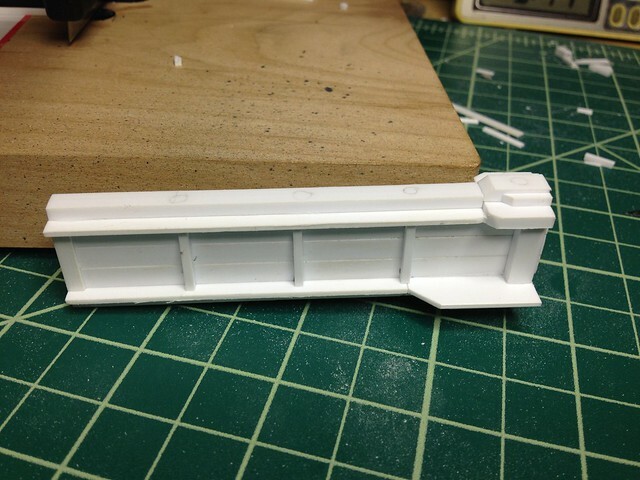 The large slot on the bottom is where the horizontal wing will fit in. 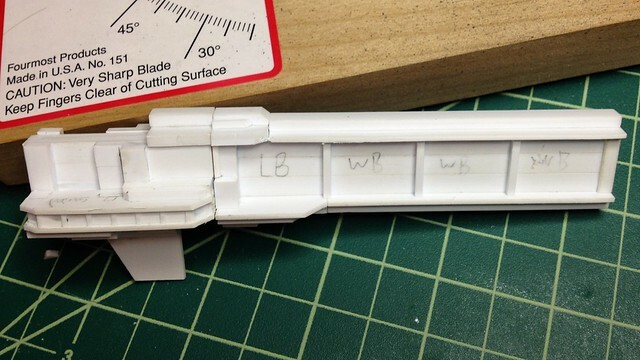 This piece slots into the weapons battery part of the hull and the rear has a tab that the engines will in turn slot onto. I've also got to do a bunch of filling on the hollow tubes. Fitting the top plate over the side batteries had me throw in the towel the other night and it took be quite a few cuts to get it right today. It took quite some time and was very frustrating. 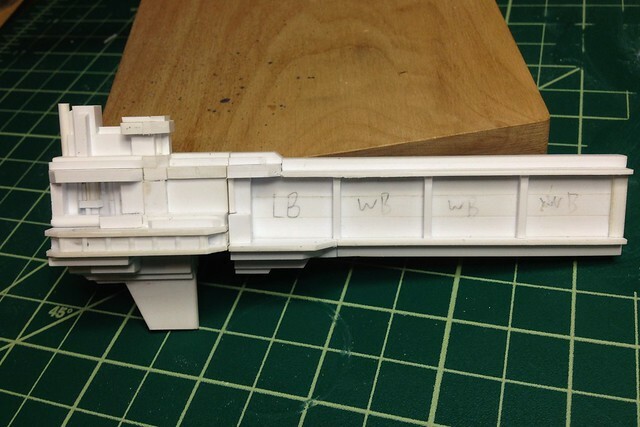 I also took a bit of time and built a little sanding jig to help get the larger styrene tubes squared off on the ends. That's it for now, I've used up a couple of my bulking stocks so far, so I am going to need to restock before I can do any more work on the upper superstructure. Let me know what you think. I feel like I am making decently paced progress with this, but I really cannot wait to go ahead with the detailing. It's going to be painstaking work, but worth it. On another note, I recently found out that one of my local hobby shops offers a casting service. 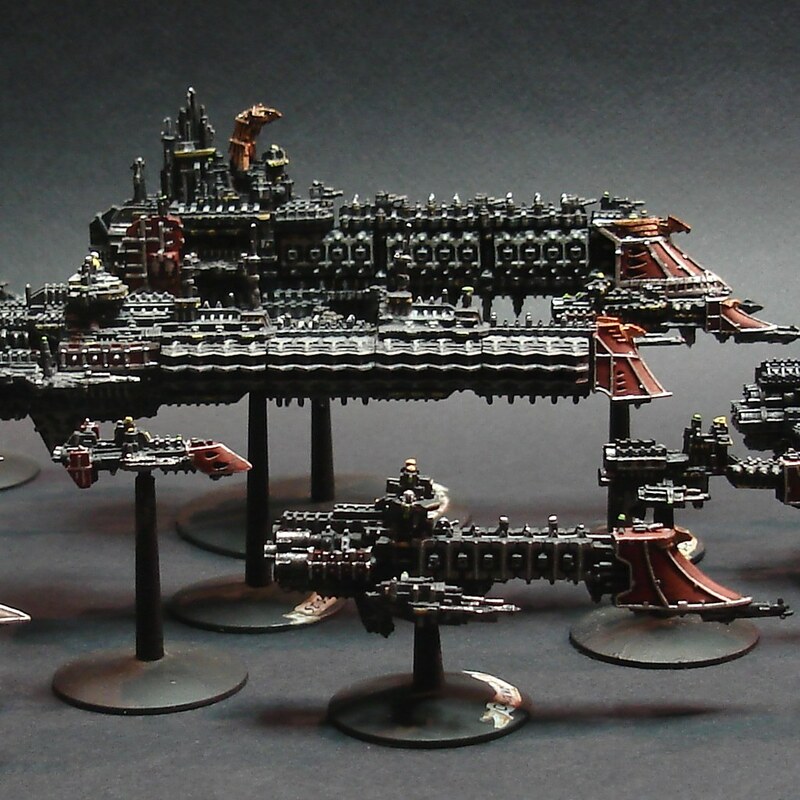 When I go in this week for styrene I am going to talk with the shop owner about casting up my other space ships, the Neptune frigate and the Jovian light cruiser. I will keep you posted. Indeed, detailing is going to be the most time consuming part. 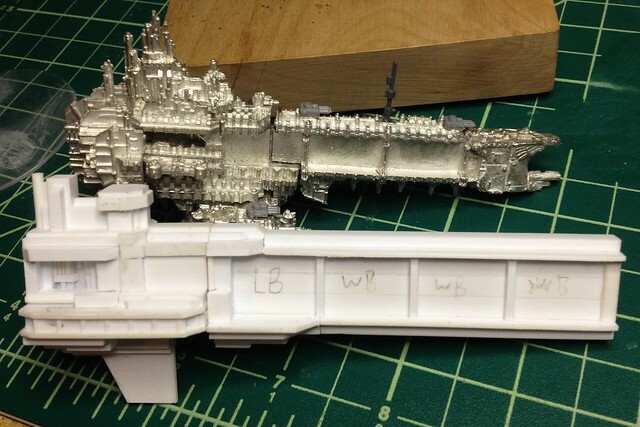 Take a good look at the Apocalypse battleship model and envision what type of stock extrusion each little detail is made from (tip: they use a surprising amount of half-round strip). If you do indeed manage to cast some it will be awesome - make sure you construct it in a way that can be split up for moulding and casting though! Some more progress today, I got to the hobby shop for some more styrene yesterday and restocked what I needed as well as getting some new forms. Unfortunately the owner was off on a trip to an IPMS show and so I could not ask on the casting service. They'll be back next week so I will find out them. So, I finished blocking out the upper super structure and the bridge. I also added the vertical details to the inset area beneath the bridge, there in a similar vein to the BFG battleships. 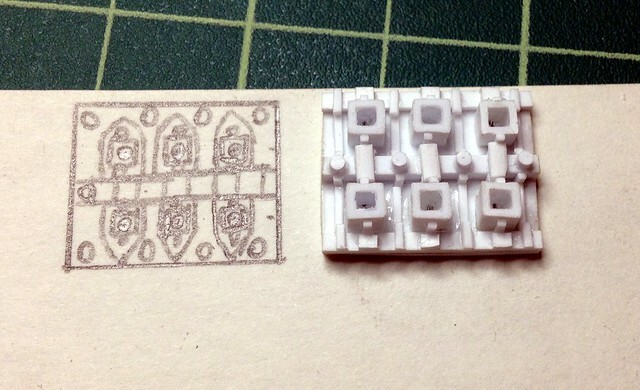 Been making the ship in the pieces I think it will need to break into in order to be more easily cast. Hope that ends up working out. Lastly I took a shot of it next to my Apocalypse Battleship. It's pretty darn massive. 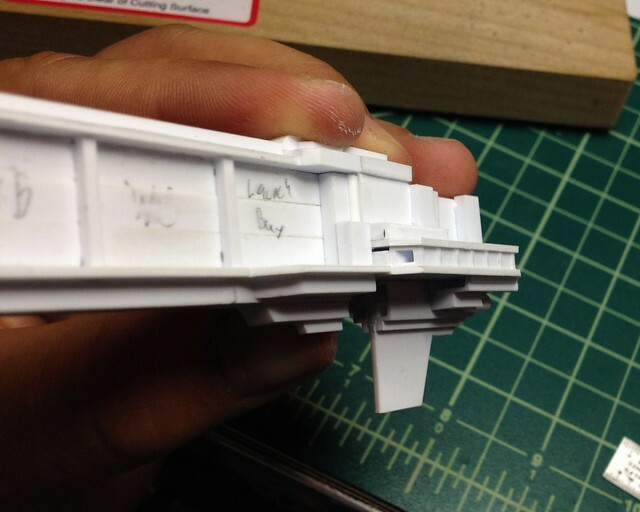 I've still got the engines, 'wing,' and prow to go, and with those it will really show some insane scale. Enjoy! Very Exciting, please please keep it coming! It's still on my to do list. Due to the scale I sorta burned out on the project at the time and wanted to build and paint a few kits before I resumed this scratch build. Don't worry it'll get back in the queue eventually.